The product poses a risk of burns because strong vibrations intensified by high engine speed may cause the coolant hose clamp fitted to the water pump nozzle to break, allowing hot coolant to leak onto the rider's left foot, which, in the worst case, may lead to scalding. 1) PS 125i  PS 150i (de 2006 e 2007); 2) SH 125i  SH 150i (de 2005, 2006 e 2007). No picture, no test report. The product poses a risk of fire because if the terminal and wire are incorrectly inserted in the ACG stator plug, the resistance of the contact in the terminal exceeds the standard value necessary, generating heat in the connection and resulting in the separation of the two parts. Once separation occurs, the generation of heat accelerates, melting the plug, which causes the motor to stop or the vehicle to catch fire. - water (from rain or washing) entering the wiring from the right-hand side of the motors stop button, which accumulates inside the plastic cladding. The accumulated water can leak into the wires and seep into the accelerators position sensor. In cold climates, the water in the accelerators position sensor can freeze, thereby preventing the motor from decelerating after the accelerator has been released. - corrosion and the resulting increase in resistance between the resistor and the terminal of the accelerators position sensor may cause the ECU to detect a fault in the accelerators position sensor. This may cause the indicator lights to activate or to fail to change in certain models. 1HFSC52A*7A400221 to 1HFSC52A*7A401210 type number of approval e4*92/61*0152. The product poses a risk of fire because, due to a production problem in the fuel control valve diaphragm, the diaphragm may become permeable, allowing petrol to leak out. This could cause petrol leakage through the vent of the diaphragm, constituting a fire hazard. Type/number of model: Motorcycles, model CBR1000, model code SC57. Description: The recall concerns certain 2006 and 2007 model year CBR1000RR units. Various VIN. The product poses a risk of fire because the air vent pipe in the fuel tank resonates at a specific engine rotation speed and in some cases this may cause the air vent pipe to crack in the brazed portion of the air vent pipe in the bottom of the fuel tank. Construction of the fuel tank makes two different brazing methods for the air vent pipe, MIG brazing and flame brazing. Only MIG brazed fuel tanks encounter high stress generated at the brazed area of the air vent pipe due to the shape of the brazing and cracking may occur due to fatigue, resulting in fuel leakage. Type/number of model: NVS 50 Today. This product poses a serious risk of injuries because the speedometer cable on the units affected may break and prevent the speedometer displaying the speed. Inspection of a speedometer cable and a brake panel revealed a split in the outer lining material (PVC), with corrosion of the winding of the outer structure and the inner winding at the area of the split, causing the speedometer reel to seize up and break. Reproduction tests revealed that certain components of the grease applied to the sliding surface of the inner cable caused hardening of the outer lining material, which might then split. If water enters through the split, the winding of the outer body and the inner cable corrode and seize up. The speedometer then breaks down when the speedometer reel or inner cable break. Type/number of model: TRX 450 R/ER. Some vehicles may present a safety defect in the steering system. The knees of the front suspension arms, both lower and upper (from the left and from the right) may have been affected during the production process, resulting in rapid wear and possible separation of the knees. If they come apart when the vehicle is in motion, control of the steering may be lost, causing an accident. 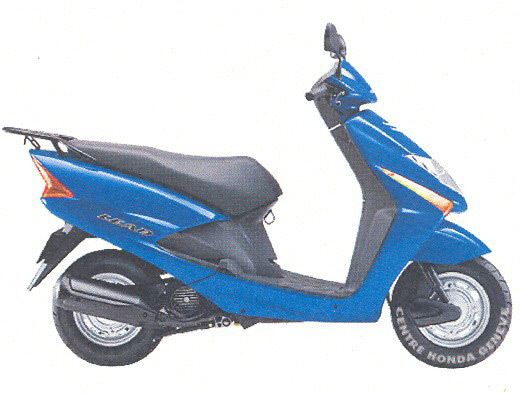 Scooter type motorcycle, 100 cc. Affected vehicles have chassis numbers from ME4JF11A* 58009186 to ME4JF11A* 58028245. The product poses a risk of injury because the nuts of the wheel hub may be insufficiently tightened, which could cause instability of the vehicle when ridden. The product poses a risk of injuries because one of the two screws used to mount the bank angle sensor may not be sufficiently tight. If the sensor becomes loose, the engine may cut out. Type/number of model: CB 1000 R/RA. The product poses a risk of injuries because part of the rear light may not function, causing the level of light emitted to fall below the approved standard, thus posing the risk of an accident. - model CRF 150 RB (big wheel) and VIN: JH2KE03B*7K000001  JH2KE03B*7K001632 // JH2KE03B*8K100001  JH2KE03B*8K100418. The product poses a risk of injuries due to a possible anomaly in the welding on the right-hand side of the swing arm. In certain driving conditions, the welding may fail and the swing arm could break, causing an accident in which the rider may be seriously injured. Type/number of model: CBF600N08, CBF600NA08, CBF600S08 and CBF600SA08, from 2008, produced by Honda Italia Industriale. 1- model CBF600N08: - ZDCPC43E08F001479 / ZDCPC43E08F014308; - ZDCPC43E08F001839 / ZDCPC43E08F015597; - ZDCPC43E08F001109 / ZDCPC43E08F013558. 2- model CBF600NA08: - ZDCPC43H08F002269 / ZDCPC43H08F014788; - ZDCPC43F08F001895 / ZDCPC43F08F017938; - ZDCPC43F08F001119 / ZDCPC43F08F011851.  CBF600S08: - ZDCPC43A08F000769 / ZDCPC43A08F017878. 3- CBF600SA08: - ZDCPC43D08F000479 / ZDCPC43D08F017098; - ZDCPC43B08F000419 / ZDCPC43B08F018178; - ZDCPC43B08F000119 / ZDCPC43B08F018022; - ZDCPC43B08F000899 / ZDCPC43B08F018118. The product poses a risk of injuries because the speedometer may display incorrect information. Water may get into the wiring and build up in the U-shaped protection tube for the ground wire. This could trigger a short-circuit in the terminal of the VSS (vehicle speed sensor) and, consequently, cause the speedometer to fail. The product poses a risk of injuries because the weld seam on the left-hand side of the swing arm may be incorrectly positioned which could cause the swing arm to break while the motorcycle is being ridden and thus cause an accident.  CB1000R (2009 model): ZDCSC60A*9F004614  ZDCSC60A*9F004807 // ZDCSC60A*9F002348  ZDCSC60A*9F002380. Full list of VINspdf is attached. The product poses a risk of injuries because the mounting bolts on the rear brake master cylinder may not be properly tightened and could possibly come loose during use affecting the operation of the rear brake. Stranica je generirana za 0.054 sekundi uz 20 upita.